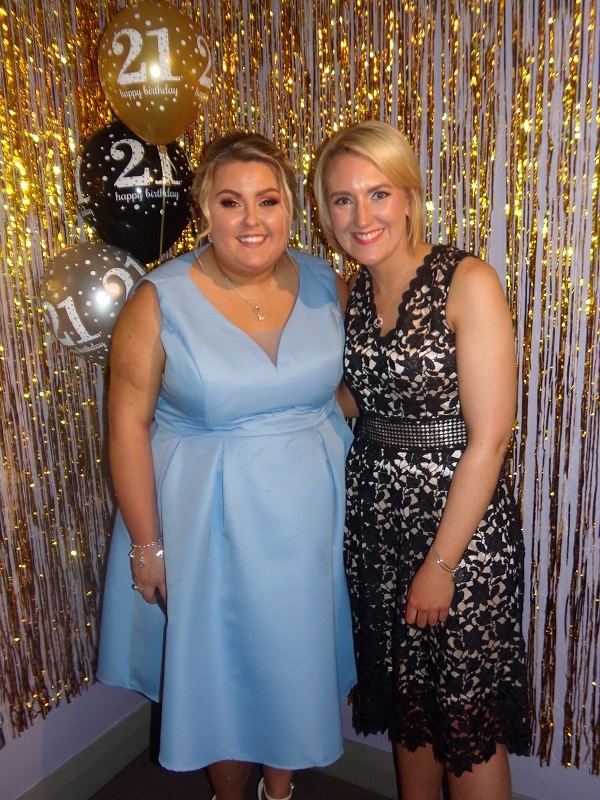 It’s been a while since I have blogged but I’m back with a super exciting one! When planning your wedding there are lots of things that you want to make sure happen on your wedding day. Apart from making sure you have the best day with no stress, let someone else handle any problems, you want to make sure your guests enjoy themselves and remember how great it was. 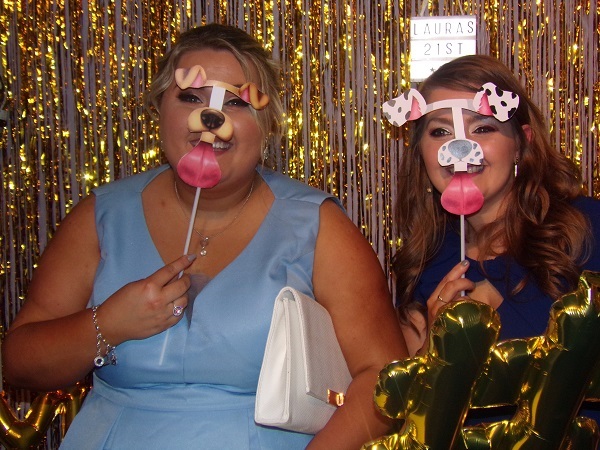 Photo booths have become so popular in the last number of years but they can be a big cost on top of your already pricey wedding. But did you ever think of making your own Selfie Station? Well here’s how! 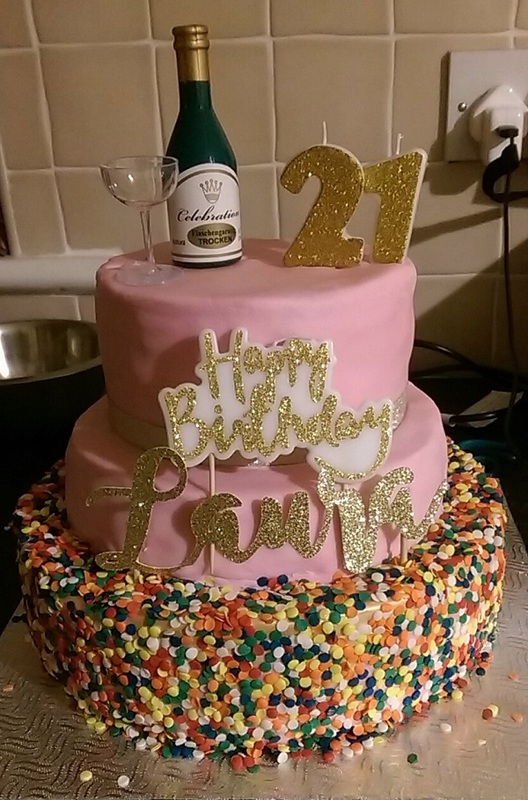 A while back, we had a family 21st, Laura. When it comes to parties I’m always thinking what can I do that’s different or unique to add a little extra something to the event. 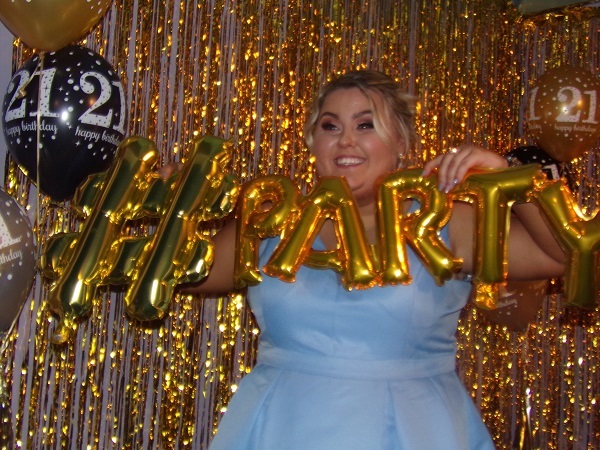 A couple of months before the party I decided I was going to surprise the birthday girl with a Selfie Station on the night of her party because she is obsessed with Snapchat and selfies. I made it my mission to go all out and make it WOW and thankfully what I planned in my head worked! I searched on Pinterest alot for ideas and also for links to design files for props, both free and paid. I got most of the bits online or in local shops. The theme was going to be black and gold mostly. DIY started weeks in advance. I was having tea at a friend’s house one weekend and I spotted her glass jars from jam, sauces, etc washed and ready for recycling and told her I would take them for her! Que the gold can of spray paint and I had holders for my props! Gold spray paint cost about €7 in a local Art Supplies shop called Spectrum. I got all the design files for the props online. One bundle (here) was specifically related to 21st but you can get them for other birthday ages too. 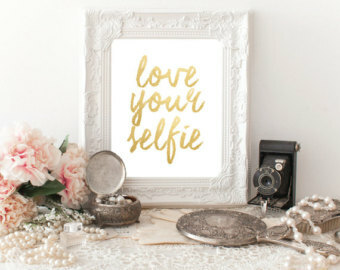 You can find lots of wedding related props online, especially on Pinterest. Search for Free ones first and if you like them you are saving yourself money. My favourite bundle of props was the Snapchat filters (here)! These went down a storm, we had so much fun with them! I also found all of the emojis (here) which were fun too. Once I gathered all the files that I wanted, I sent them to a local printing company, Think Print, to print each one out on a heavy gsm A4 gloss card. Once I received them, every prop was cut out, remember to keep a bit of the white down the centre of the snapchat dog ones, etc. To make the props, I got a clear duct tape in Woodies for about €7 and I ordered white balloon sticks on Woodies website, they didn’t carry them in store. I got about 50 sticks for €7 but had to pay for delivery on top. The sticks were very long so for some props I cut a little off the ends. I ended up having nearly 50 props! What’s an event these days without an Instagram Frame? 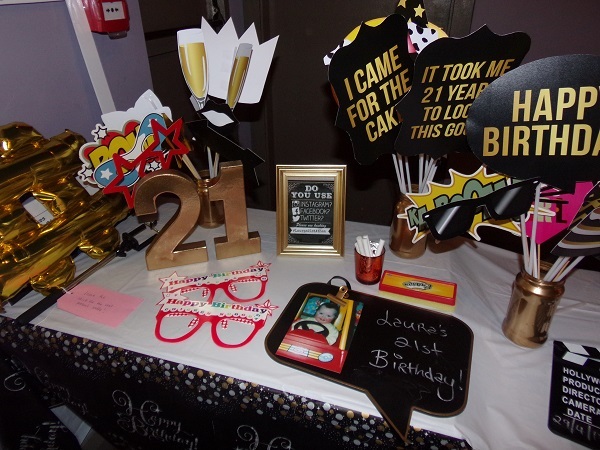 One of my colleagues had the design file and kindly gave it to me so I was able to edit all the details myself before printing, I used Laura’s Instagram handle, location of party, etc. Use your wedding venue and wedding date for the number of likes. Again, I emailed this to the printers and they printed it on a foamex card and cut out the hole for the middle. 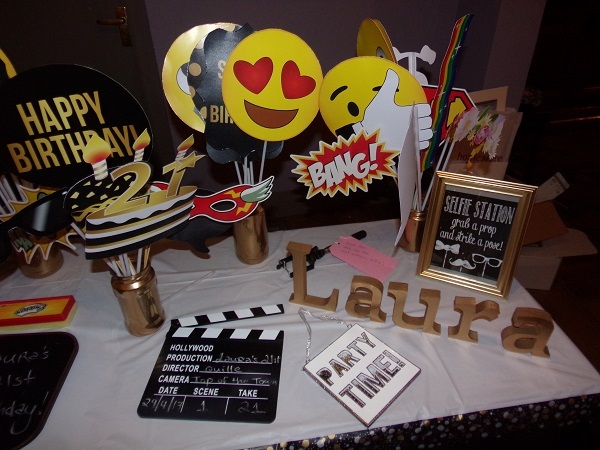 A few weeks before the party Laura asked us should she get an Instagram frame and we all said they were so overdone! Anything to throw her off! So she was delighted with that surprise! 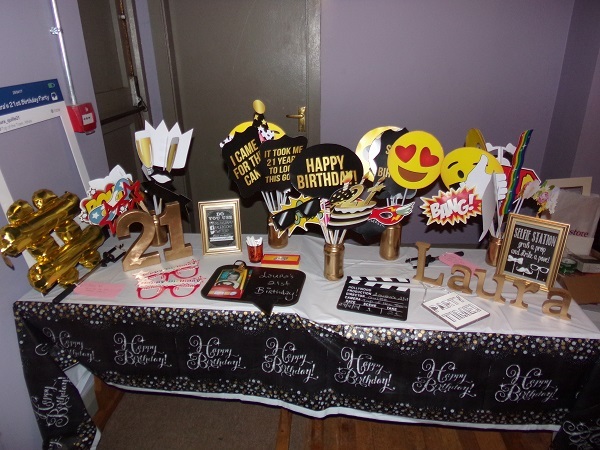 Other props I got were little chalk boards, hashtag and party balloons, party time wooden sign. (Full list is below). Wooden letters (light up or not) are really popular, I posted about them a couple of years ago here. 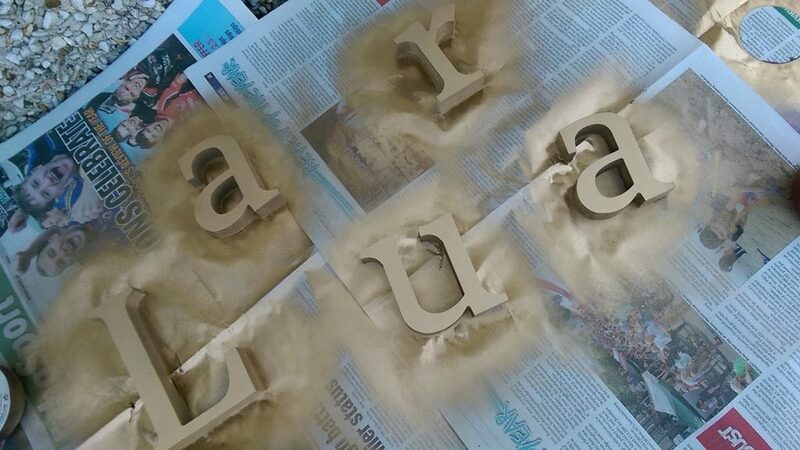 I got cardboard numbers in The Book Centre in Wexford, and I got the smaller wooden letters in the Art Supplies Shop where I got the spray paint. I sprayed all of these too so they matched the gold theme. You need a fine day and plenty newspaper for this. I got two gold foil backdrops from Hippenings. I was a little unsure on the size until I got to the venue but these worked out perfectly as we put one on each wall into the corner. 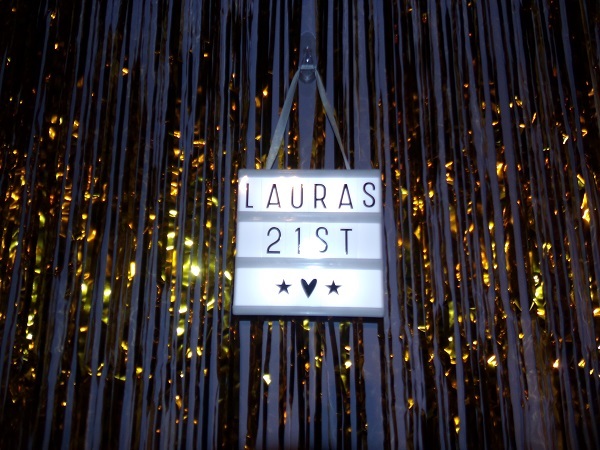 We used blue tack to put this up but you could make a wooden or plastic frame that’s portable if the venue doesn’t allow you to stick things up. I came across a few samples of how to do this on Pinterest. Light up boxes are so popular and fun now for all occasions and even in shops. I got a really cute one in Next and it had a little ribbon handle to hang it. 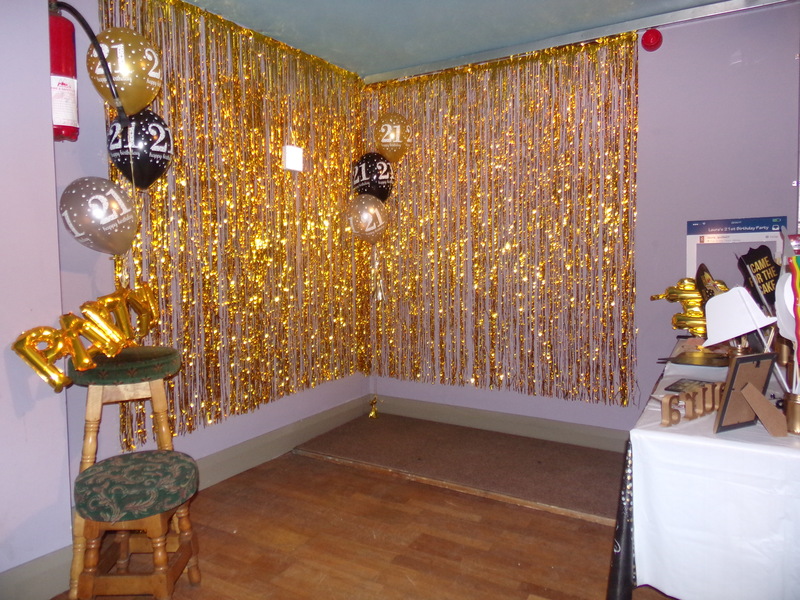 I used a clear hook from Homestore and More to hang this amongst the gold foil backdrop so that it was in the photos. The hook comes off the wall clean after but check with your venue if you plan on doing anything like this. 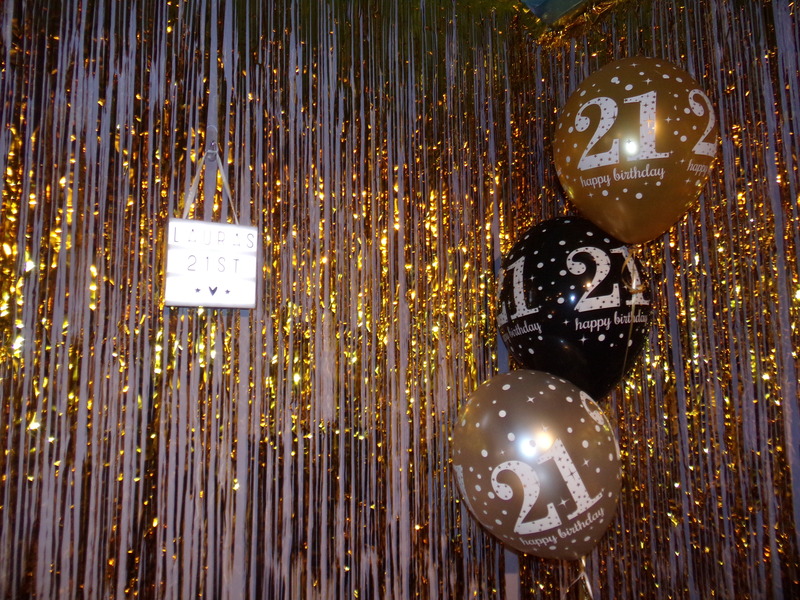 I added a few black and gold balloons to either side of the foil backdrop to finish it off, these were from Woodies. Even without the props, it’s a great backdrop for photos! 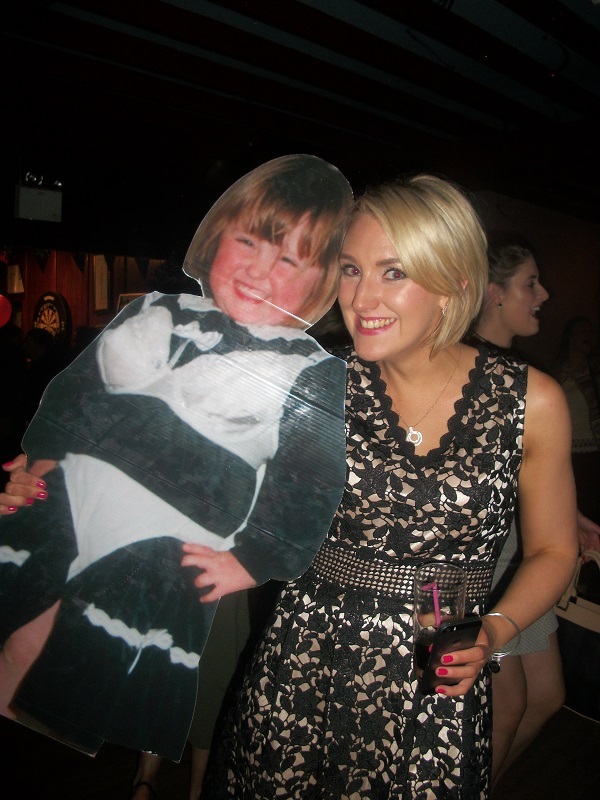 My most favourite thing, but it wouldn’t be for your wedding as such, maybe for a hen party, was the cardboard cut out of Laura when she was 4 years old. I raided the photo albums, found the best photo and again sent to the local printing company to print 3ft tall. 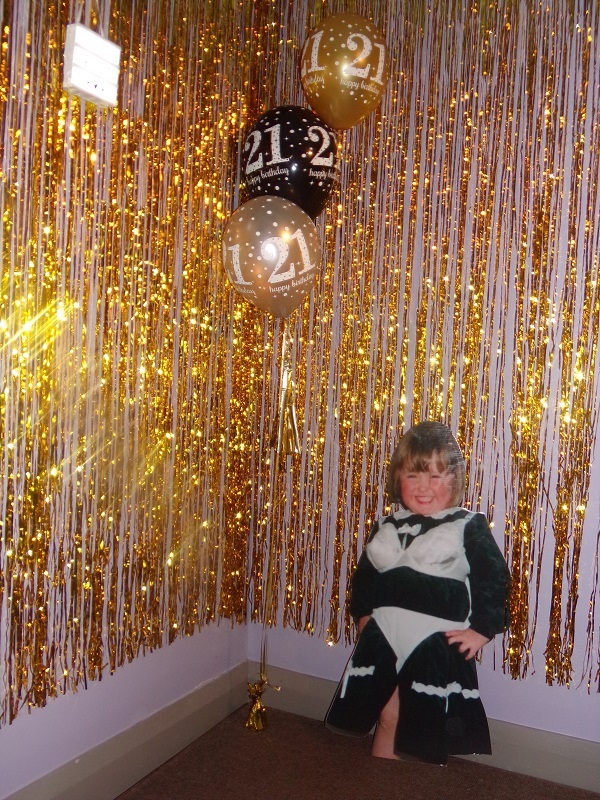 Loads of people were taking photos with it and sure what was a 21st without a little bit of embarrassment for the birthday girl. So there you have it a Selfie Station for under €200! On another note I also made the cake! I got the Laura caketopper from Project Party who make them to order. The customer service by Alana and the presentation in the way it was delivered were super! Thought really goes into it. These are perfect if you are looking for your new married name. Make your wedding cake personal. They also do Hen Party cake toppers! 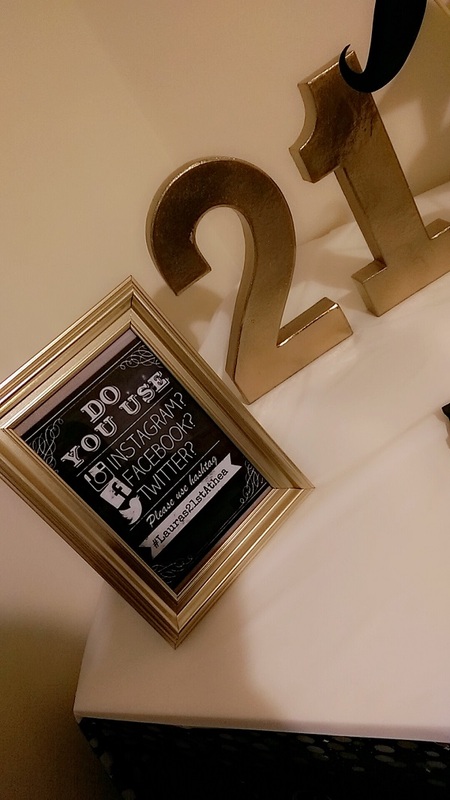 If you make your own selfie station, whether for a wedding or a party, be sure to post a photo to my Facebook page here. I would love to see it! Aw thanks so much for sharing our cake topper and your kids words. Cake looked amazing, hidden talent you’ve got there.